The figure in question I decided must have only 1 version in each series so that the comparison is even rather than a M.U.S.C.L.E. with multiple sculpts and having the result being influenced by that. This will go to a vote so please vote 1, 2 or 3 in the poll and feel free to post comments. The figure I have chosen to compare is Iwao. He has only 1 sculpt in each series and I’m a big fan of the sculpt. The M.U.S.C.L.E. Figure is a classic! It was one of the first figures I ever owned and to me that sentiment alone will make it hard for me to go past if I had to vote. He has a strong look, the fist in the air is iconic and the sculpting of the rock like pieces is brilliant. The negatives here only come later once I saw the Anime and collected other versions of Iwao. The M.U.S.C.L.E. has no expression and no tail. He doesn’t look a lot like the character in other forms. 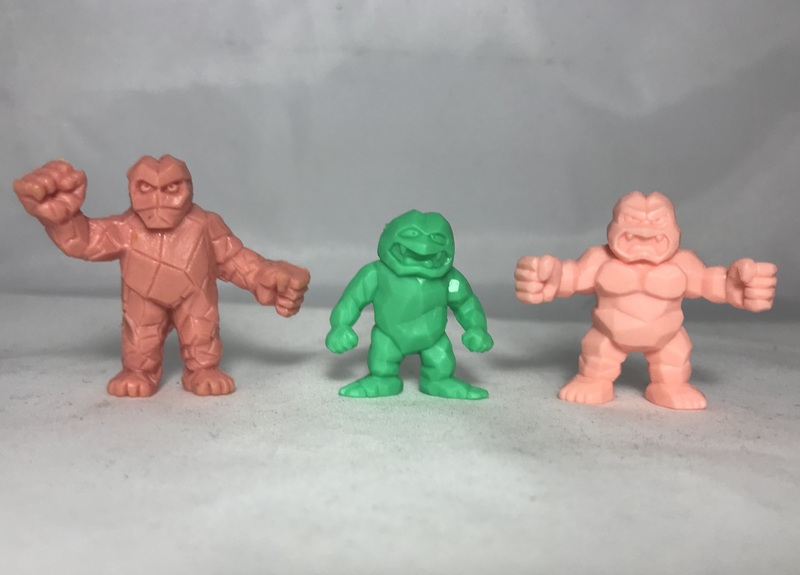 The 1991 figure is smaller than the M.U.S.C.L.E. and because it’s a series 3 figure, it’s quite difficult to get which means I don’t have a flesh one. It does have a facial expression and a tail which is accurate, however I do like this figure the least. It’s hard to imagine that upon owning just the 2 Iwao figures until this year that looking at these 2 you’d be surprised if I told you they were the same character. On a positive note the 1991 Kinkeshi is a prized figure in my collection because it is difficult to obtain (I’m lucky enough to own it in 2 colors) and I’m a big Iwao fan. Now onto the Kinkeshi Premium. I was pleasantly surprised when I received my set and the Iwao had no tail. It meant he was more in line with the M.U.S.C.L.E. than the 1991 sculpt. Although he had put on a bit of weight since the 1980’s Figure was made judging by the chunkiness, he has a great angry expression and again this version is shorter too. 3 very different figures of the same character. I did this exercise with a few different figures that I’ll showcase on my Instagram account in the coming days but this was the most interesting as the figures were very different whereas most others had very similar sculpts across the 3 versions. Which version of the Iwao sculpt is your favorite? This entry was posted on Monday, September 17th, 2018 and is filed under UofM News. You can follow any responses to this entry through RSS 2.0. You can skip to the end and leave a response. Pinging is currently not allowed.